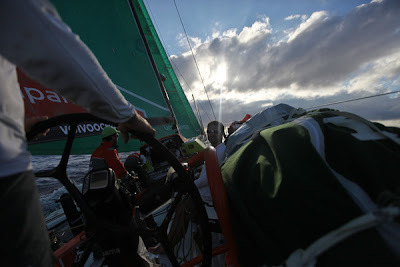 Groupama are preparing to split from the leading pack in a bid to protect their second place on the overall race leaderboard, as a light wind zone close to Miami threatens to shuffle the fleet positions over the next 48 hours. 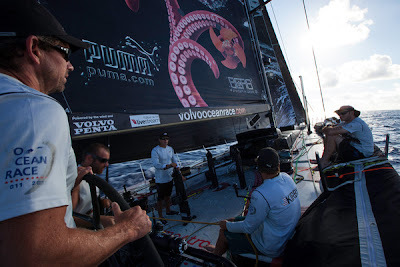 After two weeks of racing on Leg 6, PUMA Ocean Racing powered by BERG continue to lead the fleet into the final 650 nautical miles as Team Telefónica and CAMPER with Emirates Team New Zealand slug it out for second place. However, according to race meteorologist Gonzalo Infante, a high pressure system blocking the way to the finish could cause compression in the standings as early as Monday morning -- putting the top three teams under pressure and potentially throwing a lifeline to fourth placed Groupama sailing team. Infante says the high will dissipate over the next 48 hours but prior to that the teams will need to choose between diving inside the Turks and Caicos Islands or crossing the centre of the light wind area by taking a more northerly track. 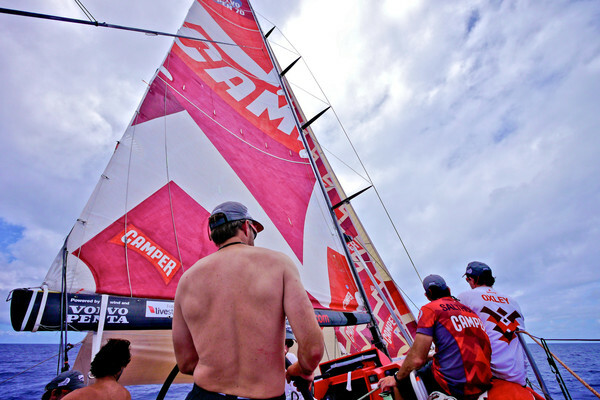 At 1300 UTC today PUMA had pulled out a 38.8 nm lead over second placed CAMPER who had edged back ahead of Telefónica by just 0.2 nm. 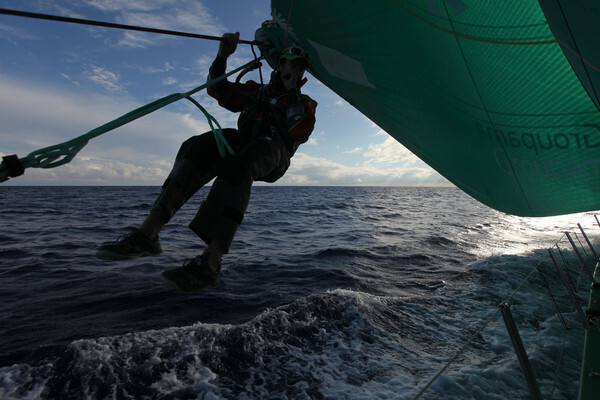 Meanwhile, fourth and fifth placed Groupama and Abu Dhabi Ocean Racing -- 121.6 nm and 163.6 nm off the lead respectively -- were lining up to split from the leading three and pass west of the Turks and Caicos Islands. Groupama watch captain Damian Foxall said the French team were treading a fine line in their bid to catch up. “The Caribbean Islands create their own areas of light wind and patches to avoid,” he said. “The trade winds have re-established very lightly just where we are and depending on the time of day there’s either a little bit more wind to leeward or to weather. 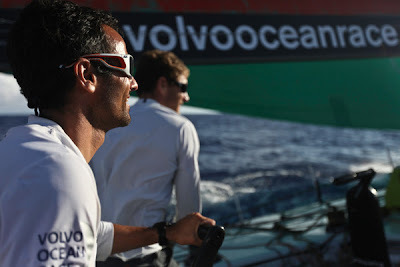 “We’ve still got a lot of work to do to get back to the lead boats, but we’re sailing a slightly different course to the others and you might see a split in the next 24 hours. 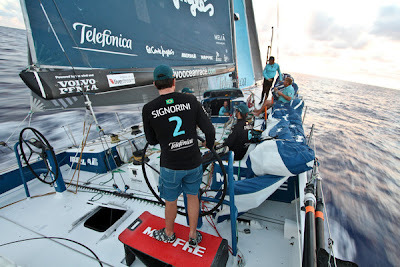 Foxall’s opposite number on Telefónica, Neal McDonald said the situation was becoming increasingly tense despite some pleasant sailing conditions. “The whole race could easily turn inside out overnight,” McDonald said today. “Once you get into the parking lot, just a small separation could make a huge difference -- one boat could have no wind while another could have two or three knots more. Within hours the gaps that we have at the moment could be closed down. 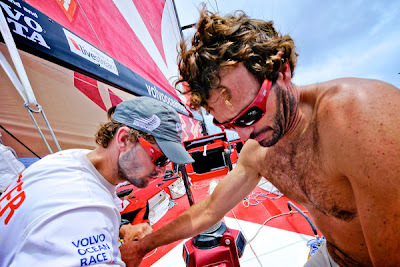 We have to be very careful; it’s a very tricky situation coming up over the next few days. 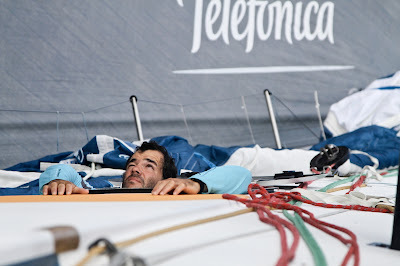 McDonald said the Spanish team’s 16-point cushion in the overall standings meant they could adopt a cautious approach to the remaining part of Leg 6 and would be avoiding any radical tactical gambits. Latest estimates suggest the leading boats will arrive in Miami on May 9, where the Downtown Miami Race Village opens to the public today, ahead of tomorrow's official opening ceremony.